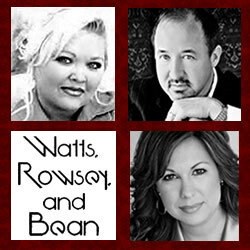 Daywind proudly announces the debut of a new Southern Gospel group with talents Nicole Watts Jenkins, John Darin Rowsey and Gina Bean, collectively known as Watts, Rowsey & Bean. For almost seven years, Nicole Watts Jenkins contributed her vocal ability to the Perrys, winning many awards and singing on several #1 Perrys hits, including their very first #1 song, "Not Even A Stone." Nicole has also appeared on Gaither Homecoming concerts and videos, at Dollywood and the National Quartet Convention, and multiple gospel television networks. John Darin Rowsey is a Dove Award-winning singer/songwriter who currently writes for Daywind Music Publishing and performed with Karen Peck & New River from December of 1999 until January of 2003. Some of his songs include "Singing With the Saints" for the Gaither Vocal Band, "Joy's Gonna Come In The Morning" for the Kingsmen and "Hey!" for Karen Peck & New River. Gina Bean is the featured soloist for Voice of Evangelism, an international ministry, and has traveled the globe with renowned Bible prophecy teacher Perry Stone. Gina and her husband Larry perform select dates outside of their duties with VOE as well. Gina has penned multiple songs in Southern Gospel Music as well, including the number one song "Just One Touch" for Karen Peck & New River. These solo artists have combined their efforts to write and record a song specifically designed to honor Southern Gospel radio, called "Turn Your Radio On." Rowsey states, "The Internet is a great tool and iTunes and other technologies have become a staple. But we were raised on Southern Gospel music on the radio. And there's nothing like rolling down the windows in your car and turning up the radio with a great Gospel song on a warm summer day." You can preview or purchase their new song, "Turn Your Radio On," on iTunes by clicking here!